Our recently concluded Travel Story Contest was a resounding success. We received over 300 stories from people all over the world about their experiences in the most diverse destinations. My team and I spent hundreds of hours reviewing all the various submissions that came in and were amazed at the quality of the stories. Strangely enough, the winning story ended up being among the ten first stories that I read. Colleen’s story literally knocked my socks off – she and her husband, while studying Spanish in Guatemala, came across an accident in a rural area. This event left such a big impact on Colleen that she went back to Canada, took $8000 from a GIC, went out and bought a used ambulance, gathered a bunch of donated medical supplies and drove the ambulance back down to Guatemala in a 4-month adventure to donate it to a village in need. Talk about personal initiative and generosity…. Shortly after our contest closed and all the winners had been chosen, I called Colleen on the phone and she was ecstatic about having won our Grand Prize: a two-week sailing adventure for two, sponsored by G.A.P Adventures, a world leader in socially and environmentally aware travel. During her recent stay in Toronto, Colleen and I had a chance to meet in person in one of my favourite restaurants in Greektown and it was a pleasure meeting this dynamic woman first-hand. During our brief lunch I had a chance to learn more about this woman who is a world traveller, ESL teacher, artist, mother and so much more. I am proud to introduce to you Colleen O’Brien, the Grand Prize Winner of our 2006 International Travel Story Contest. As a child, my family moved every couple of years, so traveling was instilled in me at a young age. My father was in the aviation business, my husband and I started a flying service in Medicine Hat, Alberta, and three of my four children (and I) got our pilot’s licenses. Now, travel is my passion. 2. Please give us a brief synopsis of the travel story you submitted which won the Grand Prize in our International Story Contest. While visiting in Guatemala, I was witness to a terrible road accident in a rural farming area. There were no ambulances to transport the injured and dying. The victims were piled into the back of a half ton truck which had a siren. This resulted in the conviction that I would buy a used ambulance and donate it to a small village there. My husband and I drove the ambulance from Alberta to Guatemala and did, indeed, donate it . 3. How do you feel today about this experience? Do you know what happened to that village? This experience told me how fortunate we are in Canada to have such excellent medical facilities. We donated the ambulance through a humanitarian project in Antigua, Guatemala, which we were familiar with. They gave it to a village in a suitable and responsible way. Writing my story was my closure, since I did not hear of the accident or the village again after the day of the tragedy. 4. Please tell us about some of your other travel experiences. What type of travel have you done? I like to travel and live in another country so that I can feel like a citizen, not a tourist. This June, I spent a month in Rome, Italy, doing respite care of an elderly blind gentleman. It was a wonderful experience, as I got to know an exceptional man whose career was New York Times Journalist and Bureau Chief. 5. You have also taught English in China. Please tell us about that experience. Did you experience culture shock? I experienced reverse culture shock when, after 4 months in China, I went to Beijing and saw a loaf of French Bread and butter in a “Western” Hotel! Crumbs were flying! I have taught in China three times, for 6 months each time. I got back in February of this year from a teaching job at a University on an Island south of Shanghai. My previous teaching jobs were in the north of China in DaQing, teaching oilfield engineers and also in south central China in Wuhan, at a private school. All of my students had studied English, most of them for 12 years. They could read, write and were skilled in English Grammar. My job for the most part was to help them with pronunciation and with listening. 6. Another ESL teaching assignment took you to Estonia. What did you experience there? Estonia at the time was eager to join the EEU, and English was a necessity. I was in Tallinn, the ancient capital and seaport on the Baltic Sea. There is a heavy Russian influence. My students were business men and women, administrators and politicians. It was a very sophisticated ancient city. 7. What have you learned from these various travel and living-abroad experiences? Traveling abroad has made me eager to continue traveling. I enjoy living close to the citizens and I have no problem communicating even if I don’t know the language. A smile and sign language has got me a long way! I travel light and remain flexible. Before I leave the international airport, I get maps, have a meal, use the telephone, get tourist information and books in English. I ask about public transportation at the tourist booths, knowing this might be my last chance to hear the English Language for a while. 8. What are your three most favourite / significant memories from your travels? The sooks (markets) in the U.A.E. The unexpected joys waiting around every corner. 9. How does travel fit into your overall life philosophy? Travel has made me very tolerant of differing habits and mores. The ordinary everyday people of each country are essentially the same everywhere: polite, eager to help, curious about visitors to their country, welcoming. 10. You are also an artist. Please tell us more about that. I have always drawn and painted, and my favorite subject is people! I also paint landscapes and still life. I try to have paints and brushes everywhere I go, and usually do small 8×10 works, which can be repainted into larger sizes when I am back at home. I am associated with the Federation of Canadian Artists here in Calgary and we exhibit and encourage each other to continue to improve our visual images. 11. Your son is a pilot with Westjet, a Canadian airline company. You are setting out on a special project that involves all the destinations that Westjet flies to. What are your plans? My son has commissioned me to paint in each of the cities which Westjet flies to. This might take me a year or two, as this means traveling to thirty five cities. This winter, I plan to start in Hawaii. 12. You are also planning to spend some time in Havana to study Spanish at the University of Havana. What are your expectations of this trip? How are you preparing yourself for it? Since I have only one language, English, I hope to gain a little knowledge of how my students feel, when they are learning a second language. I am using a computer program called Rosetta Stone, to introduce me to Spanish, and to give me a head start when I begin my studies in January. 13. Your travel story won you our Grand Prize: a two week sailing adventure in Greece. What special plans do you have for this trip? I am hoping that my youngest son will accompany me on this sailing trip around the Greek Islands. He and I both paint, so my luggage will include paints, brushes, palette, canvas. This will be my first trip to Greece. 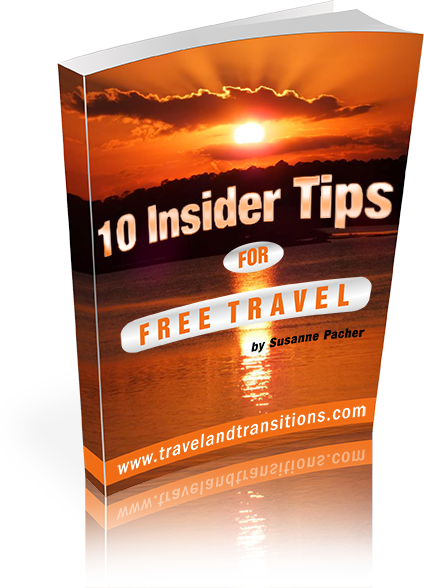 I am very excited to have won the Grand Prize, it is the first time I have submitted a travel story, and being published on the Travelandtransitions website is a life dream come true. Thanks, Colleen, for taking the time to introduce yourself to us. I know you are off on more travel soon, including an exciting trip to Havana and a wonderful sailing adventure through the Greek Islands. We hope you’ll share your experiences with us and look forward to your reports from the road.